Need more information about your inbound calls? 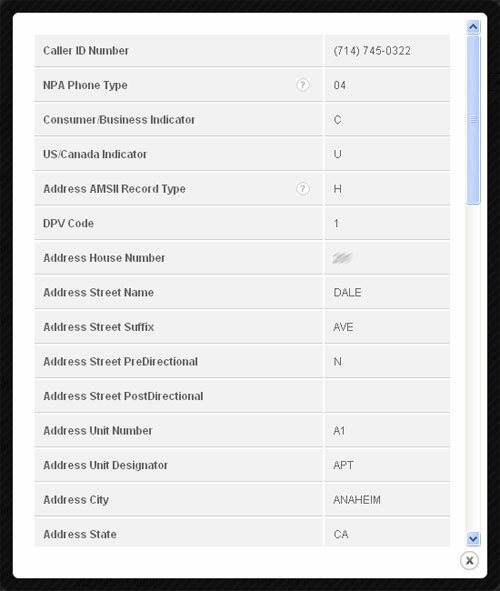 Dynamic Call Tracking offers a new add-on feature, “premium name/address append” also known as reverse telephone number lookup. We have partnered with Acxiom to provide our clients the most comprehensive, accurate source of consumer and business leads. Get high accuracy data about every phone call made through your call tracking number, including name, address, business or consumer and more. At first glance the system will show you a brief amount of information about the caller. By clicking on the magnifying glass you can find out more about them. Maximize your marketing efforts by mailing more information to your prospects that are interested but may not have pulled the trigger just yet. Sometimes that last bit of info you contact them with, a mail piece, brochure or pamphlet, can be the difference between closing a sale and losing a warm lead. 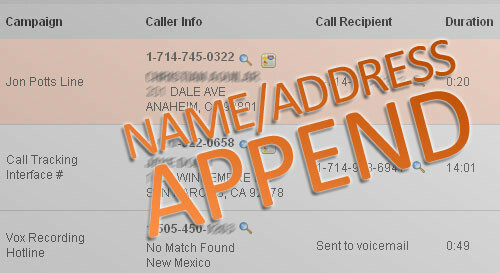 Our new name/address append feature does not come standard on all accounts but can be added to yours for free. You only have to pay when you query information, 10 cents for successful queries and 2 cents for unsuccessful ones. A whole years fees can be recuperated by just one extra closed deal. For more information about reverse lookup with Dynamic Call Tracking software contact us. You can call us @ 1-800-951-6599 for an online demo.